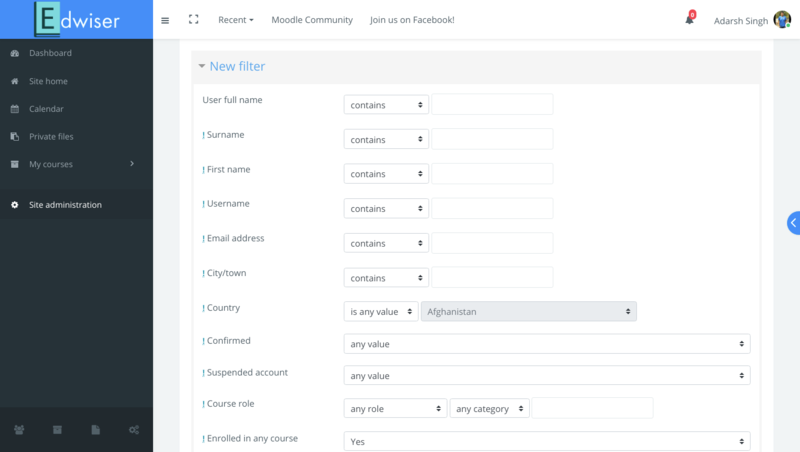 Moodle > How to Suspend Users in Bulk from your Moodle Courses? e-Learning courses are all about sharing your knowledge online with others, isn’t it? The more the number of enrolled students, the better! Having a certain number of students in courses indirectly means that much amount of gradebook data for you to analyze. But what about the data of students who have completed or about to complete their courses? 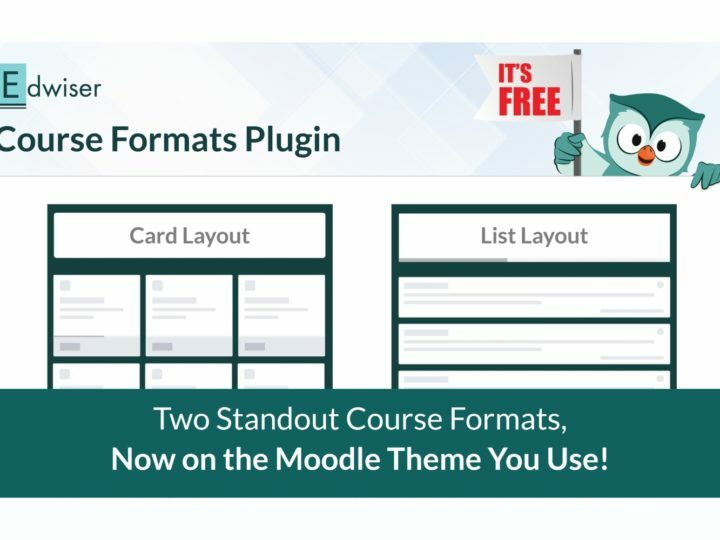 Here’s where Suspending Users in Bulk in Moodle enters the picture. But Why Suspend Over Unenroll? There’s a need for universities to keep a track of a student’s performance records across semesters. A similar need is felt in personalized courses. In this scenario, you might want to retain gradebook data for a student’s reference in the future. By suspending the users instead of unenrolling them, you can preserve their data. This data can be either used for inspection in future years or even for analyzing student performance data. Suspending one or two users isn’t much of a task. But, what if the number of such students is big? If there is indeed a way, wouldn’t it end up taking a lot of time? Here’s where I’d break it to you. 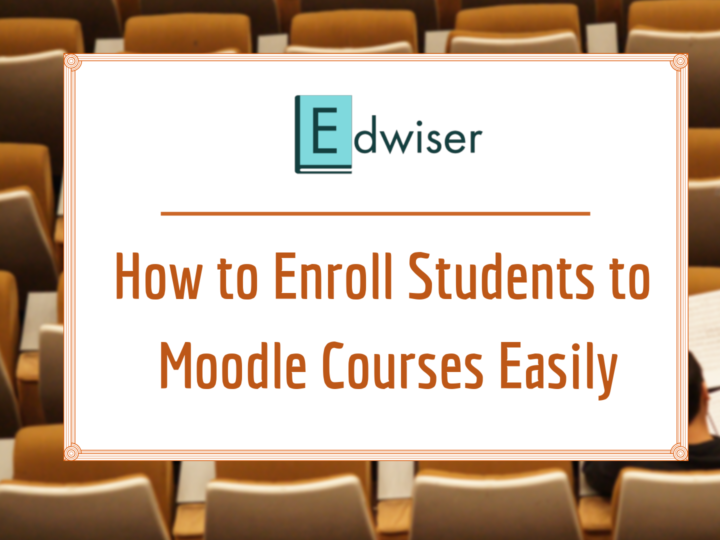 Suspending users in bulk from your Moodle courses is not as tough as you think! Here’s a quick step-by-step tutorial I’ve prepared for you. 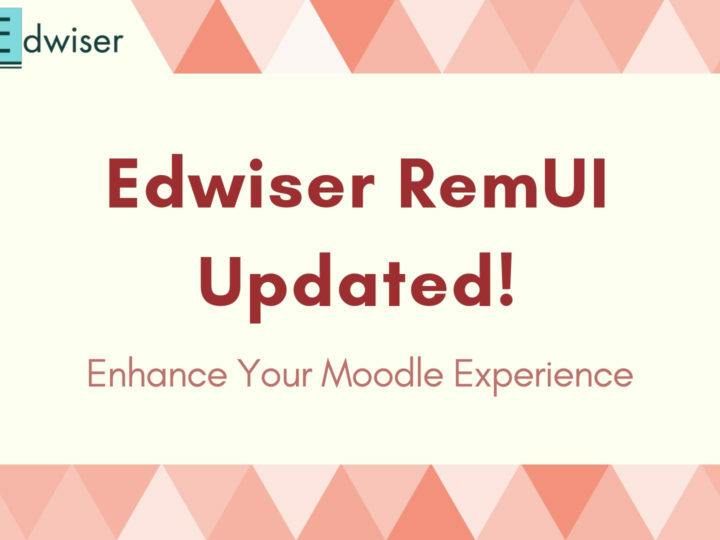 Users on your Moodle courses can be suspended in bulk by following the below given steps. 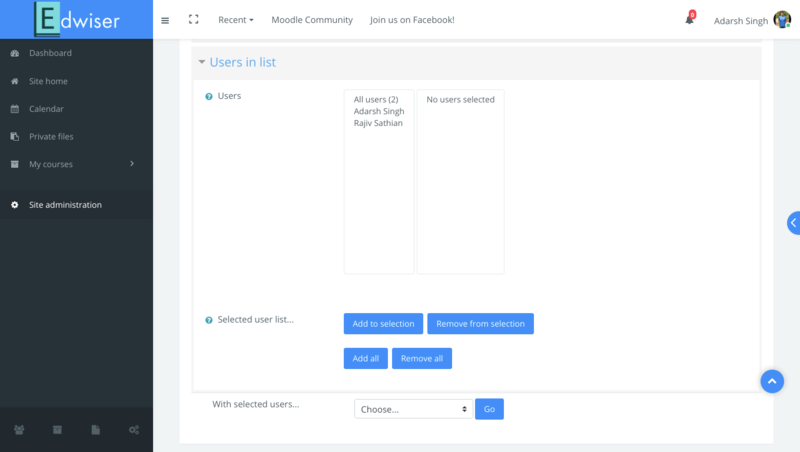 Before you can suspend users in Bulk, it’s important for you to create a list of such users. There are two ways you can do this. Scroll to the “Users in List” section. Manually select the users you want to suspend, and click on “Add to selection”. In “With Selected Users” dropdown, select “Download” and click on “Go”. Save this file as a CSV UTF-8 (Comma delimited) format. Go to the “New Filter” section. Select the filters you wish to apply and click on “Add Filter”. Click on the “Add all” button. Once the CSV file is downloaded, you need to edit the CSV File. Open the file with Excel or any other similar software. 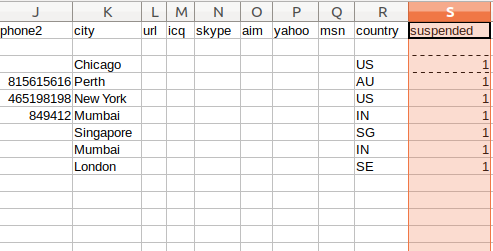 Scroll horizontally to the right-most column field and add another column “suspended” next to it. Add ‘1’ in the first cell of that column and drag the dot at the bottom of the cell, to fill all cells in that column with ‘1’. Save this file with a different file name and as a CSV UTF-8 (Comma delimited). Navigate to Site administration ► Users ► Accounts ► Upload users. Click on “Choose File” and upload the CSV file you just created. 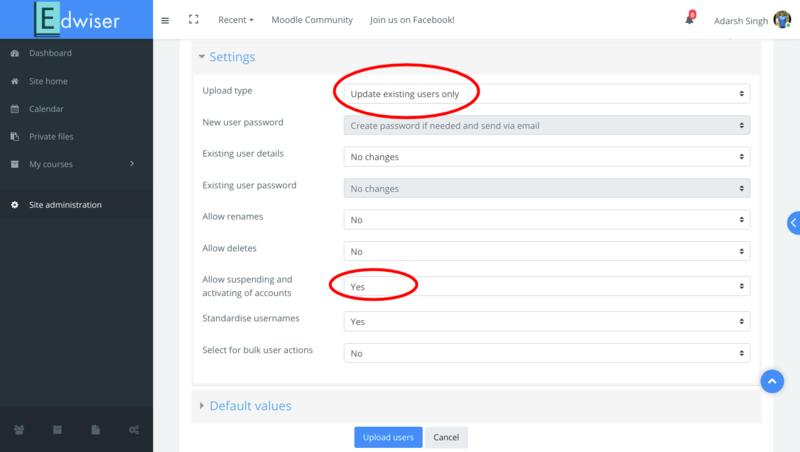 Once uploaded, click on “Upload type” in the settings window and change it to “update existing users only”. Important: Set “Allow suspending and activating of accounts” as Yes. Press on “Upload Users”. Assuming that Step (2) and (3) have been correctly followed, you’ll be able to see a list of relevant users. Scroll down to the bottom and click on “Continue”. 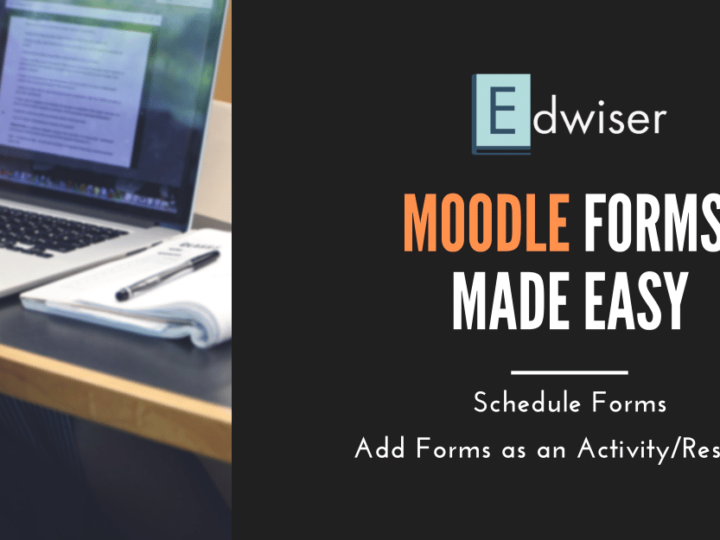 Know of more ways to suspend users in bulk in Moodle? Or maybe got some feedback for us? Let me know in the comments section below!